Wine Spectator gave this a 90 points when it came to the market. I bought it along with several others at the BC Bordeaux release in 2010. Tucked away for a little ageing and forgotten in a box, when we moved recently I found it while unpacking and worried I may have missed its drinking window. Crisis averted! No drinking windows were smashed during the enjoyment of this bottle (with prime rib done on the rotisserie). Hailing from Moulis-en-Médoc on the left bank, it’s a classic Bordeaux blend of 55% Cabernet Sauvignon, 40% Merlot and the remainder a dash of Petit Verdot. On the eyes, it’s a deep garnet with equally deep legs. The nose is beautifully expressive with deep black fruit, spice, light licorice and serious violets. The little purple flowers permeate this wine thanks to the Petit Verdot. The palate is dry with medium acidity and flavours of cassis and blackberry, plum and blueberry. A little green and black pepper with more violets rounds it out. This wine is beautifully constructed; its tannins are round and mellow and loved the prime rib. WSET Very Good plus and in its prime. I couldn’t find evidence of any more bottles being available on the BC Liquor Board website, but it you have a bottle of this, wait no longer and drink it now. 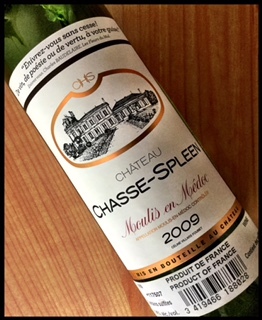 This entry was posted in Cabernet Sauvignon / Blends, France, Merlot, OTHER, Petit Verdot, RED and tagged Bordeaux, Cabernet Sauvignon, Château Chasse-Spleen, france, merlot, Moulis-en-Médoc AC, Petit Verdot, red wine. Bookmark the permalink.